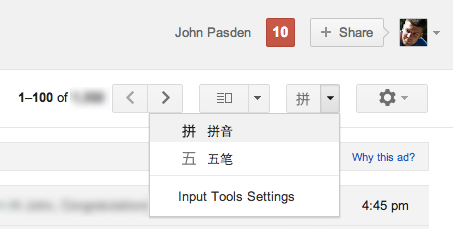 I was surprised to discover a new little dropdown option in the Gmail menu bar today, with the Chinese character 拼 on it (for 拼音, pinyin). After playing with it, it became clear that it’s an in-browser input method–a way to type in Chinese characters. Most people install Chinese IMEs at the operating system level (Chinese input is supported by Windows, Mac OS, and Linux now), but now Gmail is offering a way to type pinyin without the OS-level IME. It’s all in the browser. What’s more, it’s surprisingly fast. It’s pretty much exactly like using Google Pinyin for Windows, which I used to love, but gave up when I switched to using a Mac. This is very cool. Control-G seems to turn it on/off? Breaks repeated search (Ctl-F, Ctl-G, Ctl-G). Available in Google Drive as well! This is really a lifesaver! Last week I swatted at a little flying insect and swatted my laptop instead, sending it over the desk and onto the floor, busting the hard drive. I got English XP installed on it, but they didn’t activate the Asian input function, but this fixes all that, so now I can type in all kinds of languages without having to bother with installing all these crazy IMEs that slow the OS down. 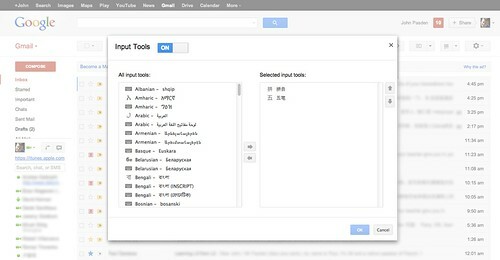 So you only ever type Chinese in Gmail website? I don’t understand how this can replace a OS input method. Excellent find! Thank you! I’ve had trouble with my language pack in Windows. Sometimes it types Chinese in Word, Excel, etc., but won’t work in web browsers. This works every time so far.